We booked our transatlantic 13-night cruise on the new Eclipse from Southampton visiting Le Havre & Cherbourg, France then Vigo, Spain and Ponta Delgada in the Azores. 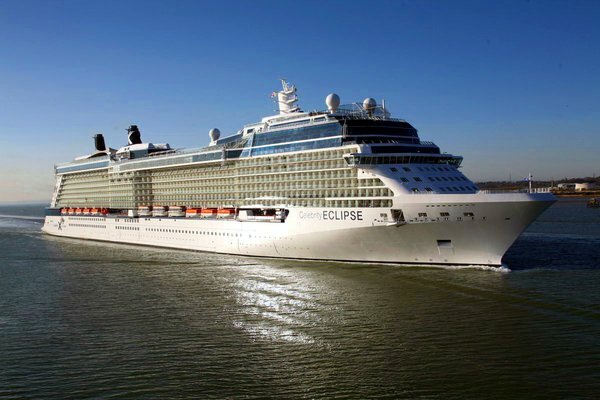 This was our third transatlantic trip on Celebrity and the maiden crossing for the Eclipse. We've cruised about a dozen times with four different lines. This was our 6th trip on Celebrity. We'd been on the Solstice from Rome to Ft. Lauderdale the previous year and this trip was just as good if not better. The Solstice class of ships are classy, clean and modern yet very inviting and comfortable. The selection or artwork is interesting and the decor is sophisticated. Celebrity's staff is efficient and welcoming - everything was done right, well and with a smile. The enhancements to the cabins such as the shower doors versus curtains is highly welcomed. Food in all venues from the specialty restaurants to the main dining room was varied and excellent - we always had several meals we liked to choose between. If you're a vegetarian like my wife there are many options to choose from - she didn't feel like she was settling or missing out in any way and in fact loved the menus. We especially like the Bistro on 5 for lunch with it's assortment of crepes. Our only gripe was our cabin steward seemed a bit unmotivated - we had to ask several times for things like extra towels and he didn't seem to clean all that thoroughly. The ship is new and we're neat people so it wasn't an issue but it was also not up to the standards we've come to expect from any cruise line much less Celebrity. On the other hand all the other stewards in our wing of the ship were hustling, literally polishing the brass in the rooms and deep cleaning every day so I think our experience in that regard was a fluke and I wouldn't let it deter us in the future from booking again. I don't know if it was the duration of the trip (13 nights) or the itinerary but being our third transatlantic it seems to attract an older crowd. Being in our 30's we were from our estimates younger than probably 99% of the passengers; often mistaken for crew and asked question we nevertheless had a great time. All in all a wonderful trip and a ship we found hard to leave. Looking forward to planning our next trip with Celebrity! Moonlight Sonata (Main Dining Room) has choice of early, late or "select" seating - we always request late as this works out best for us being busy most of the day. The food was excellent with the vegetarian options being a wonderful surprise for my wife; our dining staff was excellent - like going to eat with friends every night. The only specialty restaurant we tried was Qsine which was excellent with a real great selection of foods from all over the world presented by a quirky and friendly staff (cover charges applied). The Ocean View cafe (buffet) on the upper decks had a great selection of food but was often crowded and it could be difficult at times to find seats. Activities such as seminars were good but Celebrity struggles with it's production shows - we still found them to be a pretty amateur affair by our standards (which are pretty reasonable). Also at least on transatlantic westbound trips they tend to schedule the second show, which is normally after late seating dinner is over, early to before late dinner which we find very annoying. We eat late so we don't have to shower and dress for dinner early (which you also need to do for the show) so moving it before dinner means we miss them fairly often. I'm basing my "amateur" comment on four trips on Celebrity in the last two years. Dining room staff in the Moonlight Sonata main dining room really exemplified why we choose Celebrity so often - they were wonderful. Friendly, welcoming, got everything right and paid attention to what we ate more or less of, they figured out what we liked and didn't like without our even asking, and adjusted our orders accordingly. The ship was only six months old when we cruised and this was her maiden voyage westbound across the Atlantic so everything was new and in excellent condition. We love the layout and decor of the Solstice class ships, the only thing we miss from another cruise line is a wrap around Promenade deck but that's a minor issue. The Solstice class as the best staterooms we've ever had. The half-moon shaped shower door alone is worth the price of admission - no more wet shower curtain clamping itself to your body. Thank you Celebrity! Otherwise the cabin was spacious, in excellent condition and very comfortable. Storage might be limited for some with only one large closet and a half dozen fairly small drawers in one cabinet. Green tour and eco-lovers paradise! The Azores are beautiful, friendly and a great place to visit. Ponta Delgada is a walking friendly city with no need for car or bus if you're spending the day downtown. There's plenty to see just strolling around between the parks, churches, squares and cafes. The waterfront pier is only a few years old and is filled with shopping and food from cafes and gelato bars to restaurants. We took a 4x4 trip around the western crater and the town of Sete Cidades and would love to come back and spend a week hiking, biking and swimming. We saw none of the actual city - all the reviews we'd read online agreed and even used the same phrase that people came to Le Havre to "go somewhere else". Instead we booked an all day tour to Mont-Saint-Michel which was excellent and we would highly recommend. Either that or to the D-Day beaches though we did that tour from Cherbourg. We had a wonderful tour to Omaha Beach and the American Cemetery which we would suggest is a must-see if not done before. The tour was an all day affair so we didn't see anything of Cherbourg so online reviews we'd read prior to leaving didn't make it sound too interesting. We spent the day with friends who showed us around the old parts of the city, the beaches, the fort and old Celtic ruins. I think we ate our weight in fresh seafood tapas and Galician wine. Any easy to walk off the ship and stroll around though bring an umbrella - the locals tell us despite the constant sunshine the day we were there it rains a lot in Vigo. Pros: Ship layout, staff, itinerary, cabin, food -- just about everything.